Congratulations to Roger Hairabedian, Winner of Event #3: €5,300 Pot-Limit Omaha (€142,590)! A total of 97 players put up €5,300 to participate in the first Pot-Limit Omaha event of the 2012 World Series of Poker Europe. 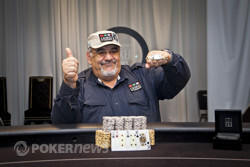 After three full days of play, Roger Hairabedian was able to rise above the field to claim the €142,590 first place prize as well as the gold bracelet that accompanies it. Hairabedian also holds the distinction of being the first ever French winner of a WSOPE bracelet. The crazy pot-limit action began on Day 1 with many players seeing the rail at a rapid pace. Names such as Greg Merson, David "ODB" Baker, Andrew Lichtenberger, David Benyamine, Roberto Romanello, Erik Cajelais, and Phil Hellmuth all came out to play but only found empty felt in front of them by the end of the day. Erich Kollmann led the field of 25 going into Day 2 but unfortunately was unable to gain any momentum on the second day of play. Much to his disappointment, Kollmann was eliminated before making the money. Other players that hit the rail without cashing include Chuc Hoang, Aubin Cazals, and Sam Chartier. The top 12 players made the money and those to bust before reaching the final table include Vanessa Selbst (12th), Douglas Corning (11th), and Bruno Fitoussi (10th). Despite being eliminated from play, those three players collected €9,299 in tournament winnings. Jason Mercier was the first casualty of the final table when he entered a pot with Michael Mizrachi and Jussi Nevanlinna. The flop came and all three players checked. The came on the turn and Mizrachi checked to Nevanlinna who bet out 12,500. Mercier called and Mizrachi check-raised to 25,000. Both players called and the finished the board. Mizrachi checked and Nevanlinna bet 60,000. Mercier called off his last 58,000 and Mizrachi folded. Nevanlina showed the for quad nines and Mercier flashed for tens full of nines before mucking his cards and exiting the tournament area. Mizrachi was in need of help and found a glimmer of hope when the paired him on the turn. Unfortunately for Schwartz, Mizrachi made his straight with the on the river and sent Schwartz to the rail in eighth place. From this point on Mizrachi made it his mission to roll over the table. At one point Mizrachi won four pots in a row and it seemed his momentum would never be halted. However, a few hands later, Mizrachi was forced to ship over a solid portion of his stack in a massive confrontation with Ville Mattila. Michel Abecassis also happened to be all in for his tournament life during this hand and was eliminated in seventh place when he failed to defeat Mattila's set of aces. The 2005 World Series of Poker Main Event was the next player to hit the rail. Joe Hachem had a relatively quiet day compared to the rest of the table and could never seem to get anything going. In a pot with four players to the flop, Joe Hachem bet pot for 24,000 with the flop reading . Ville Mattila raised to 96,000 and the rest of the table folded. Hachem committed his remaining 4,500 and was all in holding for middle set. Unfortunately for Hachem, Mattila held for top set. The turn and river were of no help and Hachem was forced to settle for a sixth place finish. Shortly after Hachem's elimination, Roger Hairabedian raised to 16,000 from under the gun and Michael Mizrachi called. Jussi Nevanlinna made it 66,000 to go and Hairabedian folded. Mizrachi moved all in and Nevanlinna called off his remaining 14,000. The board fell and Mizrachi's straight was enough to end Nevanlinna's tournament. Nevanlinna collected €33,765 for his fifth place finish. 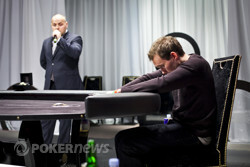 The other 'Jussi' at the final table was the next to exit a mere two hands later. With the board reading , Roger Hairabedian and Michael Mizrachi checked which caused Jussi Ryynanen to move 40,000 into the center of the table. Hairabedian looked Ryynanen up while Mizrachi mucked his cards. The fell on the river and Hairabedian bet 120,000. Ryynanen moved all in for 216,000 but was disappointed to find Hairabedian held for queens full of fives. Mizrachi was Hairabedian's next victim as the two got it all in for Mizrachi's tournament life on a flop of . Mizrachi held for a full house of treys full of sevens. Hairabedian held and was looking to improve. Hairabedian did exactly that when the struck the turn, giving him sevens full of eights and the better full house. The meaningless fell on the river and Mizrachi exited the tournament area as our third place finisher. Through the grueling heads up match that lasted several hours, Hairabedian was able to slowly chip away at Ville Mattila's stack. Eventually Mattila moved the last of his money all in on a board that read . Matilla held for kings up. Hairabedian held the superior hand, however, as his made a flush on the turn. The hit the river and Mattila was the last player to be eliminated from the tournament. PokerNews extends its congratulations to Roger Hairabedian for conquering the impressive field to take home his first piece of WSOPE glory. Be sure to stay tuned to our coverage throughout the rest of the World Series of Poker Europe. Roger Hairabedian raised to 38,000 and Ville Mattila called. The flop was and Mattila led out for 35,000. Hairabedian called and the turn was the . Mattila moved his last 40,000 into the middle and Hairabedian called. Hairabedian was in the lead with his flush and stayed that way when the finished the board. Mattila will collect €88,130 for his efforts. Ville Mattila raised to 42,000 from the button and Roger Hairabedian called. The flop came down and both players checked. On the turn, the , it was checked again. The river was the and Hairabedian took it down with a 50,000-chip bet. Ville Mattila completed from the button and Roger Hairabedian popped it up to 46,000. Mattila called and the flop came . Hairabedian bet 45,000 and Mattila instantly shot his hand to the muck. The next hand Hairabedian bet the flop once again in a raised pot and Mattila threw his hand away. He's now down to only 137,000 in chips. Roger Hairabedian just raised to 32,000 and Ville Mattila defended his big blind. The flop came down and Mattila check-called 16,000. On the turn the hit and Mattila check-folded to a 45,000-chip bet. Mattila has been losing chips throughout this level, and he needs to turn things around fast in order to change a chance against Hairabedian. With the flop reading , Ville Mattila bet 35,000 and Roger Hairabedian called. The turn was the and both players checked to see the finish the board. Hairabedian moved a stack of 60,000 into the middle and Mattila released his hand. Roger Hairabedian raised from the button to 26,000 and Ville Mattila called in the big blind. The flop came down and Mattila check-called 30,000. On the turn the hit and this time Mattila check-called 70,000. The river was the and Mattila checked again. Hairabedian tanked for about 20 seconds before announcing a pot-size bet. The bet was 252,000 and Mattila open-folded . Hairabedian is up over a million and he extends his chip lead. "You think he's gonna die, but he multiplies!"